Regional award winners are eligible for the ASC International Excellence in Teaching Award and ASC International Outstanding Educator Award, and in addition the ASC International Outstanding Researcher Award is awardedas outlined below. The prize(s) are bestowed at the annual ASC International Conference. Please note that the final deadline for regional nominations is typically set at the end of February. The Associated Schools of Construction Awards are made annually to recognise staff members’ contribution to construction education, excellence in teaching and/or research, service to the Associated Schools of Construction and dedication to the construction profession. The ASC Regional Outstanding Educator Award reflects similar expectations of excellence and commitment in service and output, but at a more senior level and with a minimum seven years of teaching experience. The ASC International Excellence in Teaching Award and ASC International Outstanding Educator Award (1 maximum per award per year) are chosen from the recipients of the awards made at regional level by the ASC Awards Committee. Finally, the International Outstanding Researcher Award (1 maximum per award per year) recognises an individual who has significantly contributed to the dissemination of scholarly work within the Associated Schools of Construction community. ASC Regional Teaching Award: Any current member of academic staff with a minimum of two years teaching experience from an ASC member school, and who has provided service to the ASC at the regional level. All nominations shall be forwarded to the Regional Director. ASC Regional Outstanding Educator Award: Any current member of academic staff with a minimum of seven years teaching experience from an ASC member school. The recipient of this award is selected by the ASC Awards Committee; therefore, the nominee must have provided service to the ASC beyond that of the region (e.g. involvement in ASC organisational and/or management committees, serve as an ASC officer, serve as editor for an ASC publication, member of IJCER/Proceeding/CMCB editorial board/reviewer, etc.). All nominations shall be forwarded to the Regional Director. ASC International Outstanding Researcher Award: Any current full-time member of academic staff with research experience at an ASC member school. The nominee must have provided service to the ASC beyond the region, as outlined above. All nominations shall be forwarded to the ASC President. A nomination may be made by students, colleagues, him/herself or any other person familiar with the nominee’s qualifications. Every Region 8 member school can submit applicants as per the requirements above. A decision will be made at a scheduled regional meeting regarding which nomination(s) to advance. Letter of recommendation from the nominee’s Department Head and/or Dean. Two letters from colleagues or other individuals familiar with the nominee’s activities. Current copy of nominee’s CV. Nominee’s statement of 500 words or less describing their teaching (or research for research award) philosophy. Include evidence of quality teaching (or research for research award) and outstanding contribution to the dissemination of scholarly work within the Associated Schools of Construction community. Nominee’s statement of involvement and service to ASC. Note: the categories were revised for future operation from 2019, as outlined above. Region 8 is the international home of the Associated Schools of Construction, the professional association for the development and advancement of construction education founded at the University of Florida in 1965. 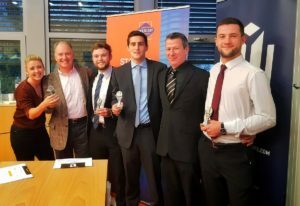 Our 2018 International Student Competition champions – Dublin Institute of Technology and the University of Denver! Copyright © 2019 REGION 8: INTERNATIONAL. All Rights Reserved.